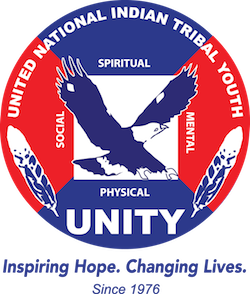 UNITY Co-Presidents participate in Arizona tribal parade – UNITY, Inc. The National UNITY Council (NUC) Co-Presidents Joseph Davis, of the Gila River Indian Community (Akimel O’odham), and Susun Fisher, Confederated Tribes of Siletz Indians, recently participated in the 93rd Annual White Mountain Apache Tribe’s parade held earlier this month in Arizona during its annual celebration featuring rodeos, carnival, cultural night performance, basketball and softball tournaments and more. Davis, and Fisher, who were also joined by NUC Western Representative Anissa Garcia, Akimel O’odham, walked through the parade with members of the White Mountain Apache Tribal Youth Council. “The parade was great! It’s always awesome going and interacting with different youth councils. A special thank you to Eileen Pike and the White Mountain Apache Tribal Youth Council for considering us. It was very humbling that the three of us were thought of to participate along side them. With the demand of the positions we are in it feels so great to have that support from the very youth that we serve every day. It was my first time at the parade as well as the fair, but it definitely will not be my last. Sap’e!,” said Davis. Members of the San Carlos Apache Youth Council also walked through the parade. UNITY Co-Presidents Joseph Davis, Akimel O’odham, and Susun Fisher, Siletz, who were also joined by NUC Western Representative Anissa Garcia, Akimel O’odham, recently walked through the White Mountain Apache Tribe’s annual parade with members of the White Mountain Apache Tribal Youth Council.